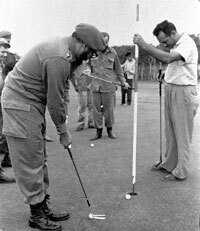 Fidel Castro steps down and according to the Wall Street Journal's Jose De Cordoba, developers are salivating at the idea of building golf courses on the island. "The message from Cuba is: bring on golf projects," says Mark Entwistle, a former Canadian ambassador to the island. Mr. Entwistle hopes to develop Cuba's first golf community on the island's eastern end, with hundreds of villas and apartments centered on a 36-hole course. Mr. Entwistle says he knows of at least 11 other projects, in various stages of development, involving Canadian, British and Spanish developers. is the odds-on favorite to be named president tomorrow. Alarmed at the decline in the number of tourists to Cuba, Raúl has urged senior officials to make golf happen. The government is setting up an interagency golf task force. Cuban officials involved in the program say they are not authorized to comment on it. If history is any guide, bringing back golf won't be easy. "Cuba is the sand trap from hell," says John Kavulich, senior policy adviser at the U.S.-Cuba Trade and Economic Council, who has followed the travails of entrepreneurs trying to develop golf projects in Cuba. Just ask Walter Berukoff, the mining tycoon behind Vancouver-based Leisure Canada. For more than a decade, Mr. Berukoff has been nurturing a project, approved by the Cuban government, to build some 600 condos and villas for foreigners around three golf courses and a marina on Cuba's north shore, close to Havana. But for a variety of reasons, including Cuba's search for oil right next to his property, the project has gone nowhere. "We had to stop the project because no one will build a multimillion-dollar project if there are oil wells in front," says Guy Chartier, Leisure Canada's man in Havana. Mr. Chartier says the Cuban government told him it has given up its search for oil. "We plan to move the ball forward in 2008," he says. To make golf tourism work, Cuba, which does not recognize the right to buy and sell property, will have to permit leases of as long as 75 years for foreigners, to entice them to invest in the villas and condos on which modern golf development depends. Some believe those leases are the tip of the spear that will, over time, reinstate full property rights.